Gaspra (Asteroid 951) was discovered by Grigoriy N. Neujamin in 1916. Neujamin named Gaspra after a Black Sea retreat that was visited by contemporaries such as Tolstoy and Gorky. Gaspra was just another small asteroid that was given very little attention until it was discovered that the trajectory of the Galileo spacecraft would take it close to Gaspra. Following this discovery, observers through out the world made Gaspra a prime target of study. Gaspra was found to have an elongated shape with a rotational period of 7.04 hours. On October 29, 1991, Galileo came within 1,600 kilometers (1,000 miles) of Gaspra. They passed each other at 8 kilometers (5 miles) per second. This was the first time that a spacecraft made a fly-by of an asteroid. Gaspra is an irregular body with dimensions of about 20 x 12 x 11 km (12.5 x 7.5 x 7 miles). Its surface reflects approximately 20 percent of the sunlight striking it. Gaspra is classified as an S-type asteroid and is likely composed of metal-rich silicates and perhaps blocks of pure metal. It is a member of the Flora family. Several craters are visible on Gaspra, but none approach the scale of the asteroid's radius. The fact that Gaspra is irregular in shape and lacks any large craters suggests that it has a comparatively recent origin, most likely from the collisional breakup of a larger body. Gaspra has probably been in its present state for the last 300 to 500 million years. These two color views of the asteroid Gaspra were produced by combining three images taken through violet, green, and infrared filters by the Galileo spacecraft on October 29, 1991, from a distance of about 16,000 kilometers (10,000 miles). The view on the left shows Gaspra in approximately true color; the surface is covered with rocks that are somewhat less grey than those on Earth's moon. In the version on the right, the colors were enhanced to bring out the muted color variations on the asteroid and to increase the ability to discriminate between surface features. The subtle variations in color may be due to slight differences in rock composition or to differences in the texture of the surface layer. The illuminated portion seen in these views is about 16 by 12 kilometers. 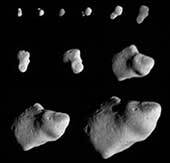 This set of 11 images shows Gaspra growing progressively larger in the field of view of Galileo's camera as the spacecraft approached the asteroid. Sunlight is coming from the right. The earliest view (upper left) was taken 5 hours, 45 minutes before closest approach when the spacecraft was 164,000 kilometers (102,000 miles) from Gaspra. The last image (lower right) was taken 30 minutes before closest approach at a range of 16,000 kilometers (10,000 miles).